Very similar to Kestrel and not always separable. Slightly smaller and slimmer, with slightly narrower wings, slightly shorter, more wedge-shaped tail and quicker wing-beats. Male is unmarked rufous above but greater coverts often blue-grey (hard to see). Whole head ash-grey without moustache or pale area on cheeks. 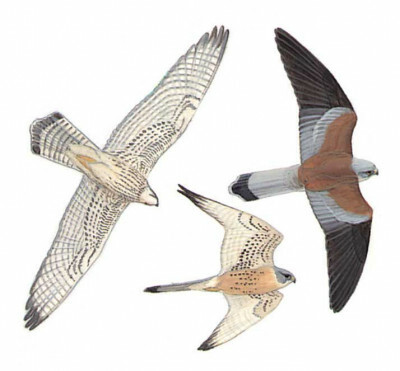 From below, white underwing contrasts with dark wing-tip and creamy buff underbody, both of which have small black spots; in some, underwing-coverts virtually unmarked (unlike Kestrel). Female very like Kestrel but on average has slightly whiter, less barred flight-feathers below, sometimes fewer and finer spots on underwing-coverts and greyer upper tail-coverts. With practice, female and juvenile identified by wing-tip formulae and pale claws (see Kestrel). Hovers less persistently than Kestrel and takes insects in flight.